Active processes in both living and non-living matter create a novel class of non-equilibrium materials composed of many interacting parts that individually consume energy and collectively generate motion or mechanical stresses. Active systems exhibit a wealth of intriguing properties, including anomalous fluctuations, non-equilibrium phase transitions, pattern formation on mesoscopic scales and unusual mechanical and rheological properties. In biology, active systems span a large range of length scales, from molecules to the cytoskeleton of individual cells, to tissues, whole organisms and their collective ensembles. 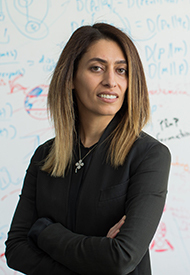 The Fakhri research group focuses on combining concepts from physics, biology and engineering to decode non-equilibrium mechanisms in active living matter, to exploit these mechanisms for engineering functional active materials and to identify universal behavior in this broad class of internally driven systems. Nikta Fakhri has pioneered the use and development of fluorescent single-walled carbon nanotubes as probes in soft matter and biophysics. Nikta Fakhri joined the MIT Physics Department as an Assistant Professor in January 2015. She completed her undergraduate degree at Sharif University of Technology, Tehran, Iran and her PhD at Rice University. She was a Human Frontier Science Program postdoctoral fellow at Georg-August-Universistät in Göttingen, Germany before joining MIT. Photo credit by Dominick Reuter.